Vietnamese police have warned that human trafficking in the country is becoming increasingly complex and international in nature. The warning was released by the General Department for Crime Prevention and Control (GDCPC) at a conference jointly held by Vietnam’s Ministry of Public Security and the United Nations Children’s Fund (UNICEF) in Hanoi on July 2. Colonel Le Van Chuong, Deputy Chief of the Standing Office on Drugs and Crimes, said that human traffickers mainly target women and children, who account for about 80 percent of the total number of victims of human trafficking. However, human trafficking rings have also bought and sold men, newborns, unborn babies, and human organs, Chuong said, adding that they also operate hired pregnancy (giving hired birth) services. According to the GDCPC’s statistics, more than 3,200 human trafficking cases have been uncovered in Vietnam since 2005, involving 5,600 traffickers and 7,000 victims. GDCPC shared several noticeable cases to the conference’s delegates. Among these includes cases in which a number of Vietnamese colluded with Chinese thugs to raid houses in remote and isolated areas in Vietnam’s mountainous northern region to abduct children after killing their relatives. In Ha Giang Province, for example, 115 such cases have occurred since 2007, and 142 children have been kidnapped. Seven people were killed and three others were injured in these cases. Also worth noting are cases involving the selling of young Vietnamese women to China, South Korea and Taiwan through fake marriages. In addition, rings that illegally send people from Vietnam to China for the sale of human organs have recently emerged. There have also been cases in which human trafficking was carried out under the cover of labor export. In such cases, traffickers usually keep their victims’ passports while forcing them to do compulsory work or make them become victims of sexual abuse. 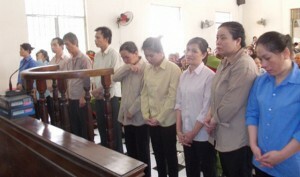 Last month, the southern Tay Ninh Province People’s Court gave sentences from three to 14 years in jail for 12 defendants who sold Vietnamese women to China as potential wives for Chinese men. Of these defendants, Tu Sy Muoi, 59, received the heaviest sentence, 14 years in jail, while the others were sentenced from three years in suspension to 12 years in prison. From 2011 to July 2012, these traffickers sold 20 young Vietnamese women to China, where Chinese men who wanted to buy the women as wives had to pay VND80-100 million ($4,800).